Try this. This is a delightful piece of copy for womens’ cosmetics over 100 years ago. While the vocabulary may have changed, the sentiment has not. If you want to be prettier, try this. Pretty and clever people use this. There’s no way you could make it yourself out of cheaper things or stuff in the garden. There is no Faux-Sciencey nonsense – eg Pro-Marine Collagen Organic lifting Serum, 24 hour hydro booster molecular oxi Q10 pro-retinol etc. (For a serious debunking of all these Bollockisms about cosmetics and other delightful crappages of our times, please, please read Ben Goldacre’s brilliant Bad Science, which explains that if your skin could actually absorb fish DNA, you would have scales. DNA is what makes and keeps you what you are, despite many imaginative science fiction flicks. We should be very pleased our DNA cannot absorb or replicate other DNAs by simply rubbing it in, and no, the Clinique lady in Debenhams should not be wearing a bloody Labcoat. The Edwardians didn’t go that far). 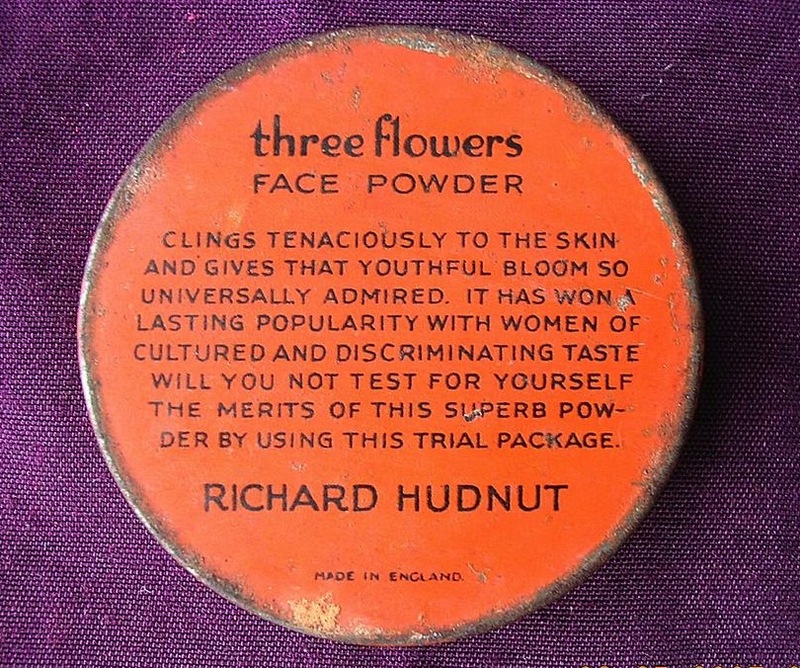 Three Flowers Face Powder also doesn’t include our lovely present-day buzzwords either, these words that mean so much: replenish, revitalize, enhance, hydrating. radiance comfort, defense (American spelling) extracts, regenerate, nourishing, youth-surge, visibly-lifting… you get the gist. This copy is accompanied by a cartoon, as opposed to a photoshopped flawless 20 year old. I spent five days last month sitting next to a talented designer photoshopping the crap out of a 24-year-old’s face for a product aimed at ladies in their 40s. And here’s the killer. This kind of advertising is at least 120 years old. And the corresponding vitriol and indignation, that’s nothing new either. But if we’re all so savvy, aware, and won’t be sold to, when it comes to picking up something off a shelf, you’re more likely to pick up the product with the pretty lady on it. Or the funky graphics for a funky price if there’s more in your wallet that day. We can still be manipulated, but it’s lovely when we’re not, and just appreciate things because we genuinely know they’re great. In that category I can put Monster Munch, Rescued Dogs, the Game of Thrones books, Baby Oil, Hugs, Spaghetti Bolognaise, orgasms, Emeli Sande and a pint in the Golden Rule in Ambleside. Nobody told me why. They just are.